Value Added Tax (VAT) is a form of sales tax. It is collected in stages on transactions Involving sales of goods. Tax paid on purchases (input tax) is rebated against tax payable on sales (output tax). 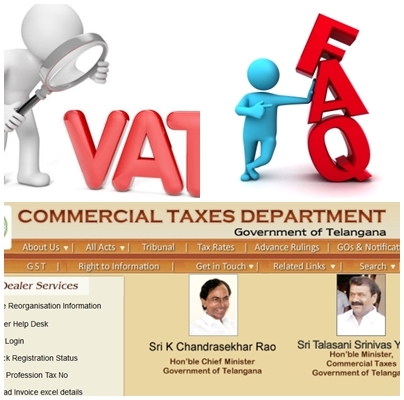 VAT is levied on sales of all taxable goods. VAT is not levied if sales of goods are not made in the course of or in furtherance of business. An individual, partnership, company etc., who sells goods in the course of business and who is registered or is required to register for VAT should pay VAT. are not specifically exempt or zero-rated. Sales of goods made in / or from the State of Telangana, which are not exempt, are taxable sales. e.g., Sale of exempt goods (Schedule I) is not a taxable sale. not made in the course of or in furtherance of business. WHAT OTHER TAXABLE SALES MAY BE LIABLE TO VAT? ARE THERE ANY OTHER KINDS OF SALES? Apart from taxable sales, there are sales that the Value Added Tax Act, 2005 specifies as exempt. WHAT IS THE DIFFERENCE BETWEEN EXEMPT AND ZERO-RATED SALES? With both zero-rated sales and exempt sales you don't charge VAT. It is VAT charged on your purchases of goods. If you are registered for VAT you can normally claim a credit for the VAT charged on most business purchases. Taxable turnover is the aggregate total of sale prices of all taxable goods including goods taxable at zero rate. Sale price of goods and transactions exempted and VAT charged on taxable sales do not form part of Taxable Turnover. What is the VAT liability of branch transfers and Consignment sales? Such transactions are exempt from VAT liability, but you are eligible to claim an input tax credit for the tax paid in excess of 4% on inputs.In inputs are purchased at 4 % Vat, then you are not eligible to claim ITC for this amount. What is meant by the term" DEALER" as per APVAT ACT?